Background and objectives The fraction of kidneys procured for transplant that are discarded is rising in the United States. Identifying donors from whom only one kidney was discarded allows us to control for donor traits and better assess reasons for organ discard. Design, setting, participants, & measurements We conducted a retrospective cohort study using United Network for Organ Sharing Standard Transplant Analysis and Research file data to identify deceased donors from whom two kidneys were procured and at least one was transplanted. Unilateral pairs were defined as kidney pairs from a single donor from whom one kidney was discarded (“unilateral discard”) but the other was transplanted (“unilateral transplant”). Organ quality was estimated using the Kidney Donor Risk Index and Kidney Donor Profile Index (KDPI). We compared all-cause graft failure rates for unilateral transplants to those for bilateral transplant Kaplan–Meier methods, and life table methodology was used to evaluate 1-, 2-, 3-, and 5-year survival rates of transplants from bilateral and unilateral donors. 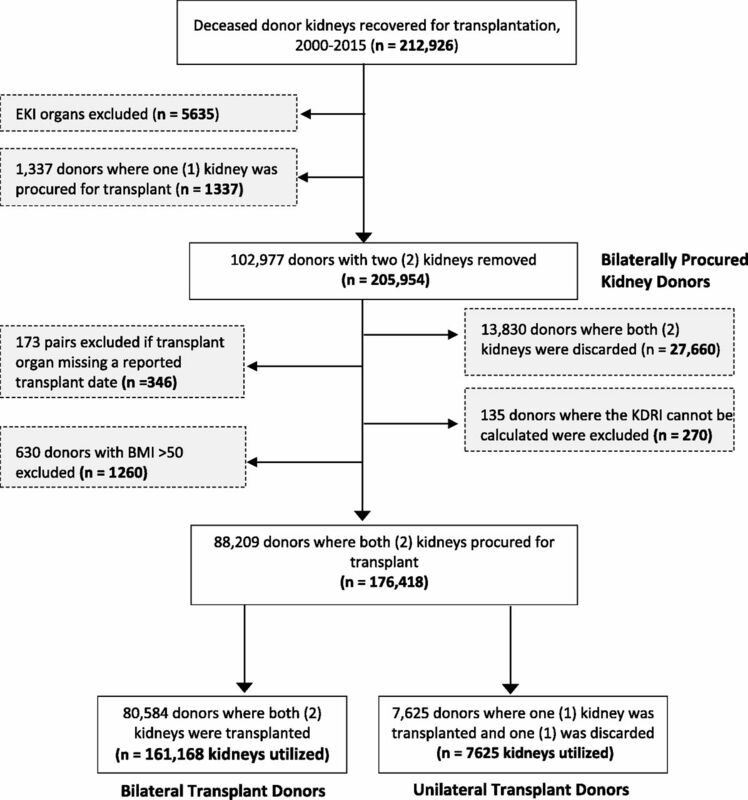 Results Compared with bilateral donors (i.e., both kidneys transplanted) (n=80,584), unilateral donors (i.e., only one kidney transplanted) (n=7625) had higher mean terminal creatinine (1.3±2.1 mg/dl versus 1.1±0.9 mg/dl) and KDPI (67%±25% versus 42%±27%), were older, and were more likely to have hypertension, diabetes, hepatitis C, terminal stroke, or meet Centers for Disease Control and Prevention high-risk donor criteria. Unilateral discards were primarily attributed to factors expected to be similar in both kidneys from a donor: biopsy findings (22%), no interested recipient (13%), and donor history (7%). Anatomic abnormalities (14%), organ damage (11%), and extended ischemia (6%) accounted for about 30% of discards, but were the commonest reasons among low KDPI kidneys. Among kidneys with KDPI≥60%, there was an incremental difference in allograft survival over time (for unilateral versus bilateral transplants, 1-year survival: 83% versus 87%; 3-year survival: 69% versus 73%; 5-year survival: 51% versus 58%). Conclusions A large number of discarded kidneys were procured from donors whose contralateral kidneys were transplanted with good post-transplant outcomes. Kidney transplantation provides a long-term survival advantage over maintenance dialysis in patients with ESRD (1–3). However, the limited supply of kidneys available for transplant results in the annual death of about 5000 patients who never receive a transplant despite having been waitlisted for an organ in the United States. The use of expanded criteria donor kidneys (and now, high Kidney Donor Profile Index [KDPI] kidneys) decreases long-term mortality in select patients (4–6), and was introduced as an effort to improve organ utilization with appropriate allocation. Dual kidney transplant using marginal quality organs at high risk of discard has also been encouraged (7). Despite these efforts, the proportion of kidneys procured for transplant that are subsequently discarded has significantly increased over the past decade in the United States—a trend that has continued after implementation of the new Kidney Allocation System (KAS) (8,9). Understanding how decisions to use or decline organs procured from deceased donors are made is an essential step to developing strategies to reduce organ discard rates. The appropriateness of discard for any individual organ is difficult to determine with absolute certainty, given the multitude of factors that affect post-transplant outcomes. Organ quality concerns, systemic inefficiencies, and regulatory factors play a role. The new KAS introduced a numerical relative quality measure, the KDPI, that incorporates ten donor characteristics in an effort to improve assessment of organ quality (10,11). However, the KDPI has several limitations, for example, an inability to account for factors such as anatomic abnormalities, injury during procurement, and subjective clinical measures that affect the assessment of an organ’s quality and, ultimately, the decision of whether to utilize an organ. Identification of donors from whom one kidney was successfully transplanted but the partner kidney was discarded provides an opportunity to control for key donor characteristics that can easily be considered to affect both kidneys of the donor, thereby allowing for a better ascertainment of factors contributing to organ discard. Other than in situations where partner kidneys may, in fact, be of very different quality (for examples, where one kidney has an anatomic abnormality), successful outcomes with the transplanted kidney would suggest a failure to recognize the discarded kidney as an organ that was also capable of benefiting a waitlisted patient. In this study, we identify deceased kidney donors who experienced unilateral kidney discard and analyze the performance of the partner kidneys that were successfully transplanted. This study used data from the United Network for Organ Sharing (UNOS) Standard Transplant Analysis and Research file. We conducted a retrospective cohort study to analyze deceased kidney donors who had kidney pairs (two kidneys) recovered for transplantation between 2000 and 2015. Over that 16-year period, we identified 102,977 bilaterally procured donors, i.e., deceased donors with two non-double/en bloc kidneys recovered. We then excluded 13,830 donors where both organs were discarded and 630 donors with implausible body mass index (>50 kg/m2). Study data were screened to detect erroneous data entries, missing data, and outliers to test normality. Donors were excluded if the transplanted organ was missing a reported transplant date (n=173) or Kidney Donor Risk Index (KDRI) could not be calculated because of missing data (n=135) (of note, the KDRI score is still calculable in the absence of data regarding history of hypertension, history of diabetes, or hepatitis C status, as these can be marked as “unknown” in the calculation). We therefore identified a final cohort of 88,209 donors (n=176,418 kidneys). Deceased kidney donors were categorized into two types: (1) bilateral transplant donors, two procured kidneys were transplanted; and (2) unilateral transplant donors, one kidney was transplanted and one kidney was discarded. The study cohort selection process is illustrated in Figure 1. The clinical and research activities being reported are consistent with the Principles of the Declaration of Istanbul as outlined in the Declaration of Istanbul on Organ Trafficking and Transplant Tourism. Flow chart of the cohort study population. Of 212,926 deceased donor kidneys recovered for transplantation from 2000–2015, 176,418 were from the 88,209 donors who had two kidneys procured and had relevant data available. Of these, 7625 were from “unilateral donors” from whom only one procured kidney was transplanted, and the remaining 161,168 were from “bilateral donors” from whom both kidneys were separately transplanted. BMI, body mass index; EKI, double/en-bloc kidney; KDRI, Kidney Donor Risk Index. A unilaterally discarded kidney refers to the discarded organ from a transplant donor from whom the partner kidney was successfully procured and transplanted. To identify the reason for unilaterally discarded kidneys, each of the 21 discrete reasons for discard identified in the UNOS Standard Transplant Analysis and Research file were mapped to eight overarching categories (Supplemental Table 1): (1) Extended Ischemia; (2) Organ Damage; (3) Anatomic Abnormalities; (4) Poor Function; (5) Donor History; (6) Biopsy Findings; (7) No Recipient Located; and (8) Other. When the UNOS code “699- Other, specify” was used, two authors independently reviewed the free-text field and mapped each field to one of the eight categories. Disagreements between reviewers were resolved by discussion/review by a third author. Organ quality was estimated by calculating the KDRI and KDPI, which are currently used as part of the KAS for deceased donor kidneys in the United States. Both scores have been validated as reasonable and reliable measures of organ quality (10,12–15). The KDRI, a measure used to estimate the relative risk of post-transplant graft survival, is calculated using ten donor-specific characteristics: age, height, weight, ethnicity, history of hypertension, history of diabetes, cause of death, serum creatinine, hepatitis C virus status, and donation after cardiac death status (16). We calculated the KDRI, as described by the Organ Procurement and Transplantation Network (OPTN), and mapped the calculated values onto a cumulative percentage scale to generate the KDPI. Because our analysis identified kidneys recovered from 2000 to 2015, we used a scaling factor of 1.2175005163 as recommended by the OPTN (i.e., the median KDRI value among all deceased donor kidneys procured in 2015) (16,17). Our primary outcome of interest was all-cause graft failure. All-cause graft failure was defined as loss of graft or recipient death. Delayed graft function was defined as a recipient being dialyzed within the first week post-transplant. Primary nonfunction was defined as the permanent absence of kidney function starting immediately post-transplant (i.e., graft failure date is equivalent to transplant date). Death with a functioning graft was defined as a recipient having a reported death date but no graft failure date, or death and graft failure dates share the same date. Death-censored graft failure (graft survival censored for death with a functioning graft) was also evaluated. Patients were censored at the time of loss to follow-up. However, given that living patients with allograft failure either return to hemodialysis or are retransplanted (both of which are events captured by national registries) and death data are compiled from multiple sources, uncaptured organ/patient loss is low. Pearson chi-squared tests and the nonparametric Wilcoxon or Kruskal–Wallis tests were performed for categorical and continuous variables, respectively. All-cause graft failure estimates were calculated for unilateral transplants using Kaplan–Meier methods. Survival curves were compared using the log-rank test of equality. In an effort to compare KDRI estimated graft survival with observed graft survival, life table methodology was used to evaluate 1-, 2-, 3- and 5-year survival rates of transplants from bilateral and unilateral donors. Time to event was calculated as the number of days from the date of transplantation to the date of reported graft failure or death, date of censoring (e.g., loss of follow-up), or the end of the study period (January 10, 2016). Analyses were performed using SAS v9.4 (SAS Institute Inc., Cary, NC). Statistical significance was determined at the 95% confidence level (P<0.05). A total of 7625 unilateral discard donors were identified from 2000 to 2015 (Figure 1). The donors were predominantly aged ≥40 years (74%) and most commonly had blood type O (47%) (Table 1). Compared with deceased donors from whom both kidneys were utilized, unilateral donors were significantly older and more likely to be women, and have had a death due to cerebrovascular accident; diabetes or hypertension; history of cancer; history of tobacco, alcohol, or drug use; or hepatitis C (Table 1). Unilateral donors also had a higher terminal creatinine (1.32±2.09 versus 1.12±0.85; P<0.001) and higher prevalence of proteinuria (42% versus 37%; P<0.001), and mean KDPI was 67%±25% for unilateral donors versus 42%±27% for bilateral donors (P<0.001). Less than one third of unilateral discards were attributed to factors that would typically be asymmetric (i.e., affect an individual’s two kidneys differently, thereby resulting in differences between the partner kidneys) and included organ damage (11%), anatomic abnormality (14%), or extended ischemia (6%). Organ quality considerations that would be expected to be similar in both kidneys from a given donor—namely, function (12%), donor history (7%), biopsy findings (22%), and inability to find an interested recipient (13%)—were the primary reasons for discard in over half (54%) of unilateral discards. Notably, the distribution of reasons for discard varied by KDRI score when stratified by OPTN categories, with organ damage or anatomic abnormality accounting for the majority of discards in kidneys in the lowest KDRI (i.e., highest quality) group (Figure 2). Conversely, the highest KDRI kidneys were most likely to be discarded because of biopsy findings or poor function, even though biopsy findings would be expected to be similar in donor kidney pairs. Further, when examining reasons for discard and considering organ quality on a continuous scale, there was an increase in the overall number of unilateral discards with rising KDPI (i.e., decreasing quality), as well as a progressive increase in the proportion of discards attributed to biopsy findings, but a progressive decrease in the proportion of discards attributed to organ damage or anatomic abnormalities as KDPI increased (Figure 3). Distribution of unilaterally discarded kidneys by discard category and KDRI (n=7625 kidneys), 2000–2015. Organ damage and anatomical abnormalities were the most frequent reasons for discard among low-KDRI (i.e., high quality) kideys, but accounted for a decreasing fraction of discards as KDRI increased. Biopsy findings, poor function, and inability to locate a recipient accounted for an increasing fraction of discards as KDRI increased. 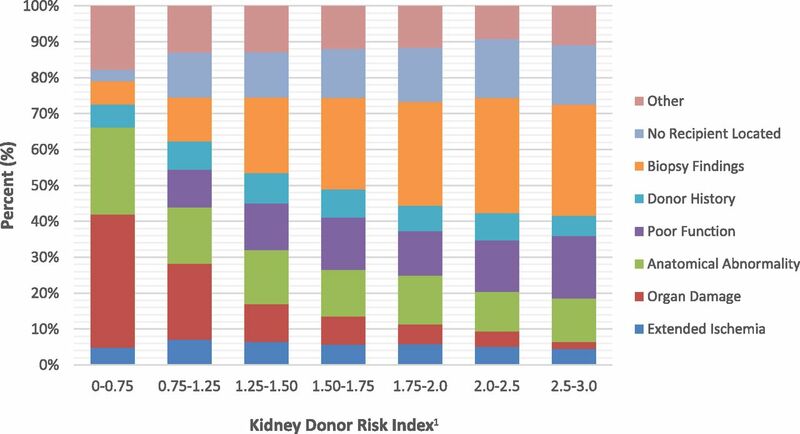 IQR, interquartile range; KDRI, Kidney Donor Risk Index. Organ quality (KDPI) of unilaterally discarded, deceased donor kidneys stratified by discard type (n=7625 kidneys), 2000–2015. The number of unilateral discards rose with increasing KDPI (i.e., with worsening kidney quality), with biopsy findings emerging as the dominant reason for discards as KDPI increased. KDPI, Kidney Donor Profile Index. Recipients of unilateral transplants differed significantly from bilateral transplant recipients (i.e., kidneys from pairs in which both partners were transplanted) on several characteristics that would influence post-transplant outcomes. The mean age of unilateral transplant recipients was almost 7 years older than bilateral transplant recipients (56±13 years versus 49±16 years; P<0.001), and unilateral transplant recipients were significantly more likely to be men, black, and have a history of hypertension or diabetes. They were less likely to have zero donor-recipient HLA mismatches (Table 2). Notably, recipients of unilateral transplants whose partners were discarded because of organ damage or anatomic abnormality tended to be younger, less likely to have hypertension/diabetes, and less likely to be black than recipients of other unilateral transplants. These kidneys also displayed the lowest mean cold-ischemic time and were least likely to be shared outside the organ procurement organization (OPO) (Table 3). The ten transplant centers that most frequently utilized unilateral transplants represent only 4% of all transplant centers, yet performed 21% of unilateral transplants. Over half (58%) of unilateral transplants were performed by 50 transplant centers (20% of centers). Unilateral transplants were almost twice as likely as bilateral transplants to be performed with a kidney from a nonlocal donor. Consistent with the increased sharing, the mean cold-ischemia time was longer for unilateral transplants (20±10 hours versus 18±9 hours; P<0.001), although unilateral transplants were more likely to have received machine perfusion. Delayed graft function and primary nonfunction also occurred more frequently after unilateral transplants than bilateral transplants (Table 2). Although death-censored graft failure and death with a functioning graft were higher among unilateral transplants than bilateral transplants, short-term graft survival rates were good for unilateral transplants overall (Table 4 and Supplemental Table 2). Among kidneys with KDPI≥60% (most common reason for partner discard being biopsy findings), 1-year graft survival was 83% for unilateral transplants versus 87% for bilateral transplants. There was a small incremental change in the difference in allograft survival between these groups over time (2 years: 76% versus 80%; 3 years: 69% versus 73%; 5 years: 51% versus 58%). Although differences were noted at the end of follow-up in overall death-censored graft failure and death with functioning graft depending on reasons for discard (Table 3), differences in time of transplantation and in follow-up time due to changes in the distribution of reasons for discard over time were contributing factors and precluded further subanalyses. This study provides a novel approach to assessing the appropriateness of the discard of kidneys that have been procured for transplant. Given the large number of patients awaiting kidney transplantation relative to the number of available organs, strategies to increase organ utilization have been implemented (4–7). Despite these efforts to improve organ procurement and organ allocation, the discard rate of kidneys from deceased donors has continued to increase in the United States in a manner that cannot simply be explained by the quality of kidneys being procured. The discard rate in the United States is significantly higher than that seen in other developed countries (although the unique diversity of the United States population and differences in the burden of disease in the donor pool make direct comparisons challenging) (8,9,18). Although decreasing the discard of these organs will have a direct positive effect on the waitlist, the pursuit of optimal outcomes is likely to result in the appropriate discard of some organs. Current limitations with the dataset create methodological challenges in distinguishing these appropriate discards/declines from inappropriate discards. Our analysis is the first attempt to examine pairs of kidneys from deceased donors from whom one kidney was discarded (unilateral discard) whereas the other was transplanted (unilateral transplant). Not surprisingly, we found that organ damage and anatomic abnormalities were the commonest reasons for unilateral discard among otherwise high-quality (i.e., low KDPI) kidneys, as these factors can be expected to adversely affect just one kidney from an organ donor. Additionally, although one would expect the relative prevalence of anatomic abnormalities to be somewhat uniform across the KDPI spectrum, this reason for declining/discarding a kidney becomes less frequent at the higher KDPI. A more detailed method of reporting the specific defect used to justify organ discard could lead to a better understanding of the variability in surgeons’ threshold for discard. This information could also be used to triage kidneys with certain types of anatomic abnormalities or other forms of damage to centers who have the experience and expertise to successfully transplant these organs. Excluding these organs from the current outcomes metrics may help incentive increased use of these organs and should be considered. Biopsy findings were the overall most commonly cited reason for unilateral discard, driven by how frequently this was given as a reason for discarding high KDPI unilateral discards. This finding raises concerns given the questionable utility and prognostic value of preimplantation biopsy findings that has been previously demonstrated. In particular, although glomerulosclerosis (GS) is the primary biopsy finding driving discards, there is limited concordance of GS in multiple procurement biopsies for the same kidney, and the association of GS with allograft outcomes is diminished in multivariate models (19–24). Differences in biopsy technique and sampling appears to confound biopsy results, limiting their value. For example, multiple biopsies performed on a single kidney before placement have been shown to have limited concordance in GS, and question the value of obtaining these biopsies and incorporating these results routinely in the evaluation of an organ (24). This is further compounded by the fact that the partner kidneys that, in the absence of anatomic abnormalities, presumably have similar histology (one study of >12,000 deceased donor kidney biopsies performed between 2000 and 2005 demonstrated significant concordance in the degree of GS between the two kidneys from the same donor ) were transplanted with reasonable outcomes in older recipients, further underscoring the notion that these discarded organs could have potentially been utilized in select patients. These limitations of procurement biopsies, including conflicting data regarding the concordance of multiple biopsies from the same kidney versus both kidneys from a single donor, ultimately weaken our confidence to broadly rely on these histologic findings as objective, reliable predictors of allograft performance. Education on the appropriate value of a biopsy in the decision to accept or decline an organ offer coupled with encouraging a more judicious use of procurement biopsies by OPOs represents an opportunity to improve the process of evaluating a kidney for transplant. Although inability to locate a recipient was the primary reason for a substantial number of unilateral discards (accounting for >1000 organs over the time period studied and >10% of unilateral discards in all but the lowest KDPI group), the use of these organs’ unilateral transplant partners was associated with low overall graft failure and mortality. Other studies have also demonstrated “no recipient located” to be a frequently cited reason for discard, accounting for over one quarter of discards overall (26). Our finding that the transplanted partners of these unilateral discards performed well would suggest that strategies that improve the allocation process for these organs could substantially decrease the number of kidney discards. For example, given our findings that 21% of unilateral transplants were utilized by 4% of transplant centers, and 58% of unilateral transplants were performed by 20% of centers, the possibility of expedited placement of these organs with centers that are likely to use them could increase organ utilization (26). Such a fast-track allocation system has been successfully implemented abroad (27). This notion is supported, at least in part, by the unilateral discards that were attributed to prolonged ischemia (6%) coupled with the fact that unilateral transplant recipients were almost twice as likely as bilateral transplant recipients to receive a kidney from a nonlocal donor. System-wide processes are essential in helping providers who are making determinations regarding organ utilization to quickly identify patients who would benefit from receiving a suboptimal kidney rather than remaining on the waitlist for an extended period of time. Interestingly, unilateral transplants were significantly more likely than bilateral transplants to be perfused after procurement. It is possible that OPOs are more likely to machine perfuse higher risk kidneys or transplant centers are more likely to use marginal kidneys if they receive machine perfusion, or both. Previous studies have suggested that an increase in machine perfusion use has helped to blunt a rising organ discard rate (9). Given the benefits of machine perfusion (28,29), OPOs should also consider increasing the use of machine perfusion for marginal kidneys in an effort to improve kidney utilization rates. Additionally, barriers to improved utilization must be addressed. It has been noted that the current report card system for transplant centers in the United States diminishes quality in favor of effectiveness, thereby creating a disincentive to broader organ acceptances for centers concerned about payer penalties or public perception (26). Realignment of incentives to promote more appropriate utilization is a key factor in reducing discards. Our data suggest that a large number of unilaterally discarded organs could have possibly demonstrated excellent performance if transplanted. In fact, the combination of inability to locate a recipient, biopsy findings, and donor characteristics accounted for 42% of unilateral discards, totaling 3212 discarded kidneys (>200 kidneys per year). Although the discard of some of these kidneys was likely truly appropriate, the use of even a fraction of them could substantially reduce the number of patients who never receive an organ. Alternatively, excluding cases of organ damage or anatomic abnormalities, dual kidney transplantation of both kidneys as an alternative to unilateral discard would potentially represent a better use of this limited resource by resulting in improved kidney function and potentially improved recipient outcomes, which would also improve the waitlist given the growing number of patients awaiting a second transplant (30). These findings emphasize the need for development of better models of prediction for graft survival as a way to help clinicians reduce the burden of subjective organ assessment and ultimately reduce of discard of viable kidneys. Previous studies have demonstrated a lack of improvement in discard rates after implementation of the KDPI, and that systemic factors unrelated to donors or recipients influence the rate of organ discard (9,18,31,32). Without better tools to assess organ quality and help identify suitable recipients for procured organs, providers are forced to rely on clinical gestalt that is vulnerable to cognitive biases, which can potentially contribute to organ discard. This study has several limitations. It is important to note that we relied on subjective reporting of reasons for discard as available in the Scientific Registry of Transplant Recipients dataset. It is possible that more nuanced information about discard decisions would reveal additional justifications for discarding one member of these pairs. For example, factors such as inability to initiate machine perfusion in the setting of vascular calcifications can sometimes lead to the discard of only one kidney from a pair of marginal organs. Additionally, the reason for discard for a large number of organs was listed as “Other.” Kidney biopsy results were not available to us; future studies may also include these results as an additional point of comparison. Also, although we rely on KDPI as a surrogate for organ quality, its predictive ability is limited and does not account for a number of clinical parameters such as injury during procurement. Finally, our analysis does not account for the regulatory environment around transplant outcomes and its effect on organ selection/acceptance. In conclusion, our analysis demonstrates a large number of discarded kidneys that were procured from a donor whose contralateral kidney was transplanted. Although these organs had high average KDPI and were most frequently discarded because of biopsy findings, their transplanted partner kidneys demonstrated good graft survival, suggesting that the majority of these discarded kidneys could have potentially been transplanted with reasonable outcomes. Our findings underscore the fact that systemic factors beyond the quality of the organ are contributing to transplant centers declining deceased donor kidneys, thus leading to their eventual discard. This work was supported by the Laura and John Arnold Foundation (S.M. ), American Society of Transplant Surgeons, American Society of Transplantation Transplantation and Immunology Research Network (TIRN) (to S.M. ), National Institute on Minority Health and Health Disparities (grant R01010290) (to R.P. ), National Institute of Diabetes and Digestive and Kidney Diseases (grant R01DK11489301) (to S.M. ), and Health Resources and Services Administration (contract 234-2005-37011C). A preliminary version of this work was presented in abstract form at the 2017 American Transplant Congress, Chicago, Illinois, May 1, 2017. The content is the responsibility of the authors alone and does not necessarily reflect the views or policies of the Department of Health and Human Services, nor does mention of trade names, commercial products, or organizations imply endorsement by the US Government. See related editorial, “Compelling Evidence of the Need for Policy Change to Decrease Deceased Donor Kidney Discard in the United States: Waste Not Want Less,” on pages 13–15. This article contains supplemental material online at http://cjasn.asnjournals.org/lookup/suppl/doi:10.2215/CJN.06550617/-/DCSupplemental.